Use where speed requirements are 120 fpm per minute or less and where economy is important. 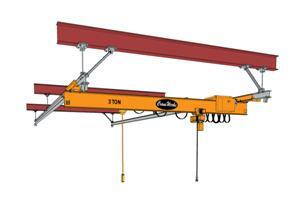 All CraneWerks bridge cranes are available with radio controls and independent traveling pendants. CraneWerks pre-engineers many bridge cranes to allow for quick delivery. Practically used in spans of 50 ft and less (Longer spans available up to 100 ft.) with the use of a third runway. 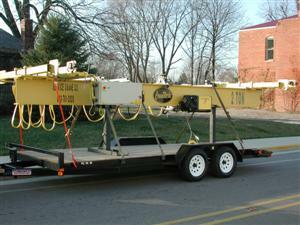 Something unique to underhung cranes is their ability to be used in applications where the transfer of a loaded hoist and trolley from one beam to another beam is necessary. This can be accomplished through available transfer switches. With the use of these switches, ceiling mounted workstation bridge cranes can be utilized to transfer a load from one underhung crane to another underhung crane (from bay to bay), from a bridge to a single spur or to multiple monorail spurs and to transfer an unloaded hoist to a Hospital spur where it can be worked on and maintained with out interfering with critical plant operations. If two hospital spurs are used one can support a maintained hoist while the other can be empty ready to accept an ailing hoisting unit. This use of hospital spurs is a great way to keep a plant “in production”. Click here for more information. These underhung cranes are ruggedly designed CMAA class C duty units (lighter and heaver duty cranes are available) see CMAA crane classification information to determine which class crane best fits your needs. Motorized bridge cranes commonly utilize electric chain hoists, underhung wire rope hoists,air hoists or balancers. 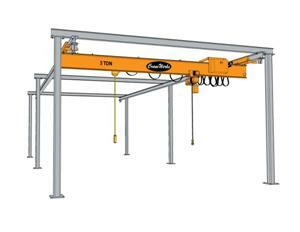 All motorized overhead bridge cranes include either a tag line or c-track festoon system. Additional festoon systems are available when power or air supply is required for below hook devices. 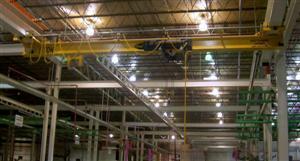 CraneWerks designs custom bridge crane and runway packages to meet any need. We offer turnkey packages that start with engineering and follows all the way through to installation. 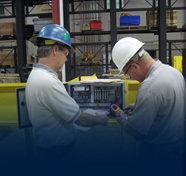 We also offer services that include crane repair/maintenance and inspections to help maintain your equipment and keep you up to date with the current OSHA requirements. 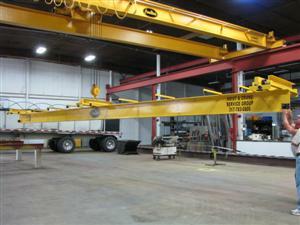 Contact one of our specialists today at sales@cranewerks.com or call 888-544-2121. 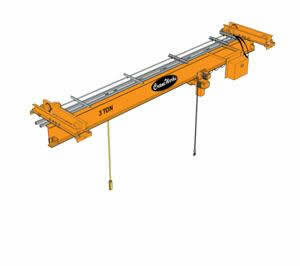 Fill out one of our award winning request for quote forms for a price on an underhung bridge crane.